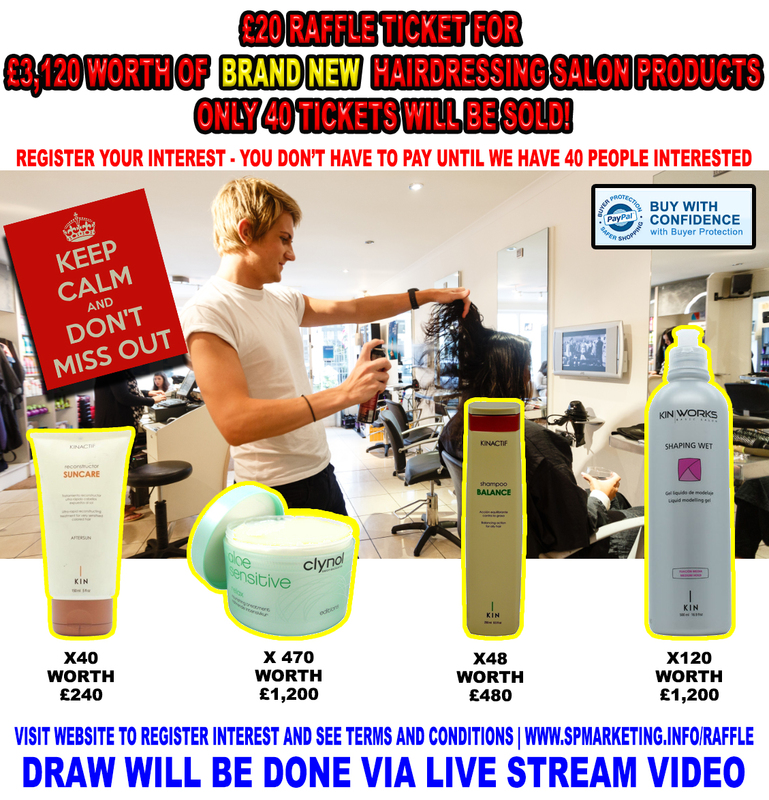 Win *£3,120 worth of Hairdressing Salon Products Raffle – £20 per ticket, just 40 tickets available. 1 in 40 chance of winning! The raffle will be taking part on www.SPMarketing.info/Raffle (it is just being advertised on Facebook). When 40 people have registered by simply leaving your email address, all registered participants will be notified and will be asked to send a PayPal payment within 24 hrs. Once all the payments have been received on the following Saturday a live streaming video will be conducted to randomly draw the winning email out of the 40 participating. As you will be paying via PayPal, you will be covered by buyer protection, so you know you will be getting what you pay for. When you collect your items you will be required to bring proof of identity (with photo id, driving licence or passport etc) that I can copy and you will be required to sign a receipt saying you are happy with and accept the items you are collecting. You are NOT required to share, like or even post anything on any of your social media. Just buy a ticket. The email will be shown and read out live! The winner will then be contacted to arrange collection within 2 weeks at a time convenient to them. The winner will also be announced in any of the social media platforms where it was advertised. By taking part in this raffle each entrant or participant; you completely release of Facebook of any responsibilities. By taking part in this raffle you acknowledge that the promotion is in no way sponsored, endorsed, administered by or associated with Facebook. *As valued by searching on Google for identical products, this is an approximate value. The real value could be higher or lower.